Because this blog is as much a diary for me as it is entertainment and cultural exchange for you, I’m including some short, random, unrelated stories here that I don’t want to forget. Curious George is my hero. Especially today. 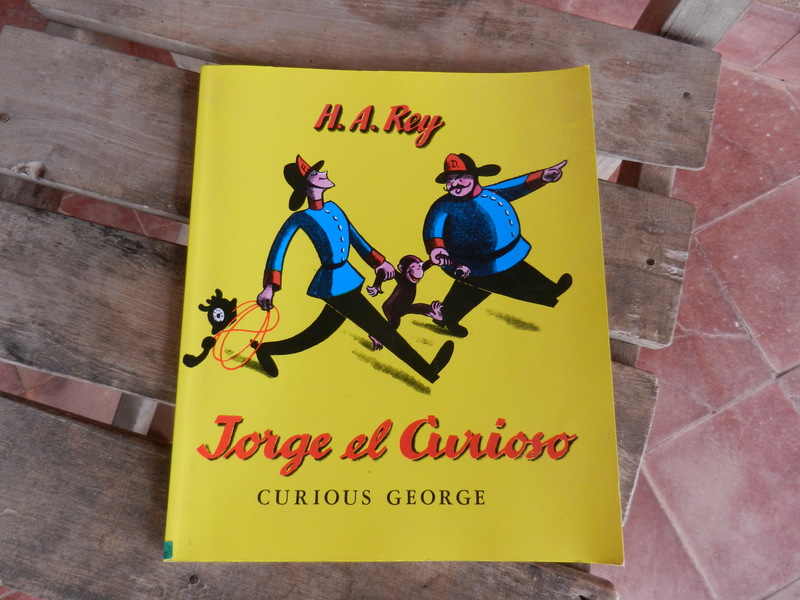 Known in Spanish as Jorge el Curioso, I have fond memories of my brother devouring every Curious George book available. He even had a stuffed monkey with a plastic mouth to whom I used to try to feed bananas and Cheerios. Last year while living with my host family I was delighted to find Jorge el Curioso in the local school library and brought it home to practice my Spanish. While preparing for today’s Kids’ Club I thought it would be fun to read this book to them. Reading is not popular in PY and I have never seen or heard children being read to by their parents in the 19 months I’ve been here. When I suggested the idea to the kids, they eagerly agreed as if I’d just offered them an entire cookie jar. As we sat on the floor together I was aware of them inching closer, even the teenagers, completely enveloped in the story like a group of kindergarteners. Some of them quietly read along with me and helped when I stumbled over a complicated Spanish word. Occasionally, I would pause and ask if they were enjoying it. “Siiiiiiiiiiiiiiiiiiiiiiiiiiiiiiiiiiiiiiiiii! 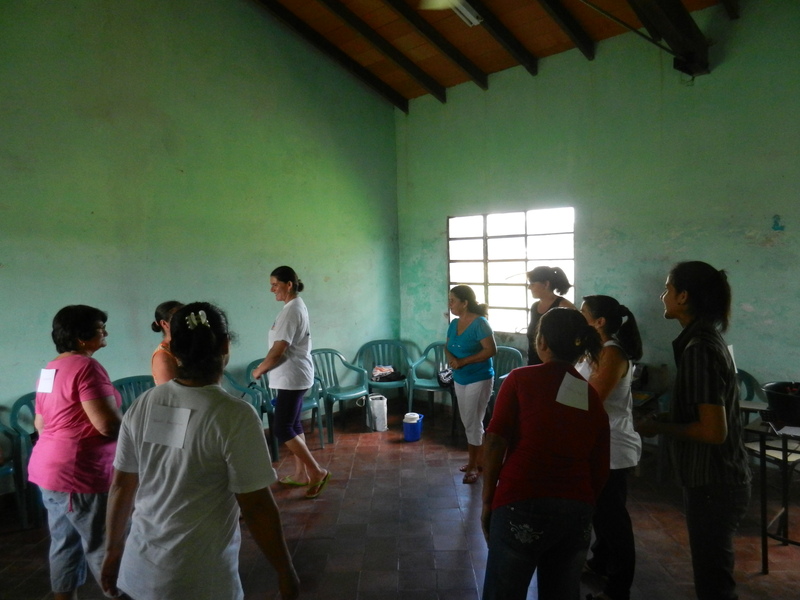 !” they replied, brimming with enthusiasm and smiles. We kept going. As a mother who read to her child every night for years, it made me sad to think this might be the very first time an adult has ever read a book to these children (ages 7-15), but I hope it sparked a desire to do it on their own in their homes as well, just for fun. Either way, it was a huge hit and we’ll definitely be doing it again!!!! 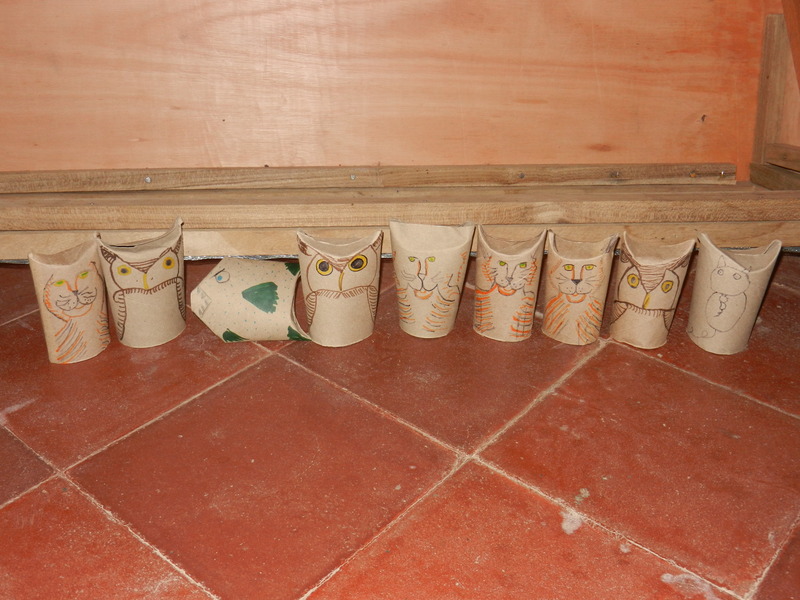 Plus, check out the animal crafts we made from toilet paper rolls. Tigers, owls, cats and a pirhana, oh my! Still laughing as I write this. Back in March during our vacation in Argentina my friends and I returned to the hostel from grocery shopping (where we almost got robbed) and they asked me for a lesson in cooking meat because some had been vegetarians or never had much experience cooking meat before now. In the hostel’s spacious kitchen, I donned my best Julia Child’s accent and proceeded to flail and instruct with an overdose of enthusiasm. They responded in kind, including some occasional, accidental words in a Spanish or Guarani, until we laughed so hard it felt like we’d just finished a Jillian Michael’s workout, and our accents somehow morphed from French to Irish to Southern to unidentifiable. Later we took our wine poolside (we did our own fun ‘wine tastings’ at the hostel with two new wines every night) and shared our answers to my infamous “100 questions”, designed to get to know others at a deeper level. The 100 questions accompany us on every vacation or extended outing. Since it takes time for four people to answer each question thoughtfully, sometimes with curious or loving inquiry from supportive girlfriends, there’s a question of whether or not we’ll actually finish them all before our service ends in December! Super fun night bonding and making good memories with friends. 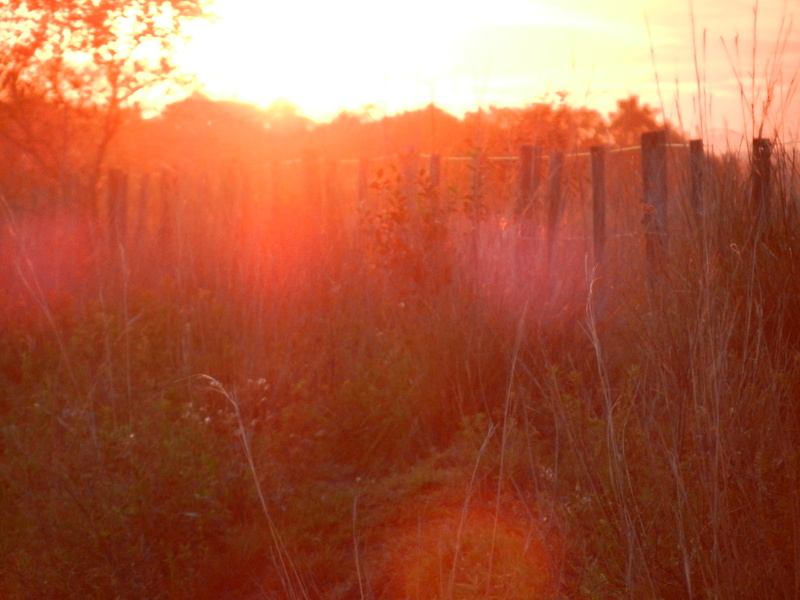 My morning runs usually take me east directly into the sunrise, a great incentive to start the day early. This morning the sky was 360 degrees beautiful so I ran west for a different perspective. Down the sole road onto the prairie I witnessed a breathtaking sky kissed with pastels of pink, blue and mint green, a thin fog floating over the vast grassland and hugging the base of the forested hills, and the golden spray of the day’s new sun yawning its warming light up and over the treeline. The goal was a morning run for my health. The outcome was sheer bliss for the soul. A real humdinger of a rain/thunderstorm that lasted all night and through the morning resulted in dozens of caterpillary-worms (gusanos) crawling under my door searching for dry land. Outside this morning I watched as they crept over the edge of the tiled patio then swam through puddles on the floor toward the house. After smooshing a few dozen, I went back inside to make coffee and upon hearing footsteps, I turned around to find my neighbor’s bull already head and shoulders through the door looking for shelter too. I got a dirty, disgruntled look after telling him there was no vacancy and shooing him out with a broom (expletives might have been involved). The door will stay closed until further notice. (I couldn’t make this stuff up if I tried.) The upside was that the frogs are exquisitely happy with all the rain and have been singing a beautiful chorus of song since midnight. Plus it makes for good storytelling. And while I do love the occasional ‘indoors day’ which provides downtime for planning, reading, studying or alone time, I am disappointed that the rain will cancel today’s Women’s club and likely tomorrow’s Kids’ Club (rain here in the campo is like a big snow day in Maine where everything closes). The kids have asked me every day for the past five days if we are having Kids’ Club and English class this weekend because they really look forward to it. How can I say no to kids who are so open and eager to learn? That kind of excitement and engagement is what makes my service so fulfilling! When you listen and let life guide you, you can’t go wrong.